On occasion Kenny and Angie focus on mosaic inlay in making their beautiful art. They excel at this endeavor just as they do in their beadmaking. This pendant necklace employs a large spiny oyster shell as the foundation for a multi-colored checkerboard of hand-cut, fitted mosaic tiles. A large round bale is equally colorful and splendid in its mosaic work and is formed by a round bone upon which the mosaic tiles are perfectly jointed and fitted. 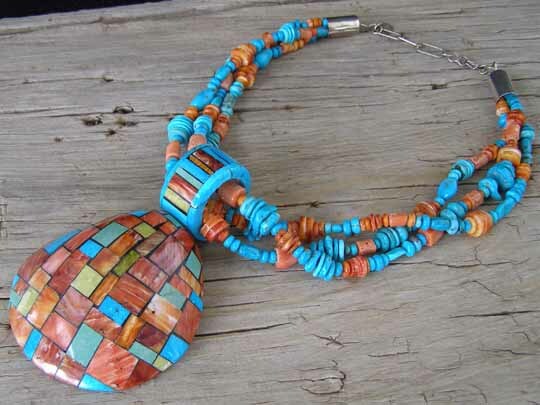 A three-strand choker-length necklace of handmade beads of Kingman turquoise, orange spiny oyster and pink coral completes this splendid creation. They used a traditional jet paste matrix to grout between their tiles and then the whole surface is beautifully polished to make a lustrous surface that is smooth to the touch. The necklace strands are a combination of beads of varying shapes and materials. Some beads are rolled with rounded edges, others are disks and some of the turquoise is still in nugget form. The pink coral beads are fashioned from branch coral and show various lengths and diameters. The three-strand necklace is 20 1/2" long. This is just the right length, in fact, because one doesn't want a pendant like this on longer strands which would allow it to swing and move. At just over twenty inches, this is not so short as to be constrictive, but it rides relatively high on the neckline and is comfortably worn at that length. A small Sterling disk at the cones is hallmarked KA.